Sublime Frequencies works its way down to the tip of the Malaysian peninsula with this superb collection of Singaporean 60’s beat, pop, and “off-beat cha-cha” instrumental classics from original vinyl 45’s. 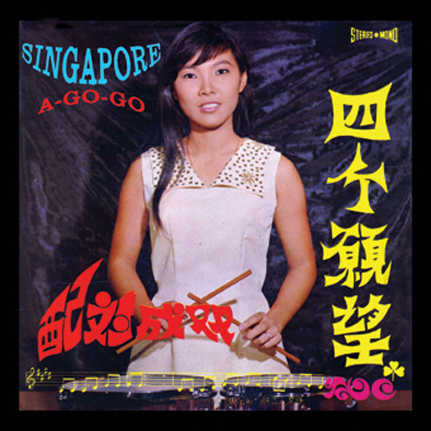 These 22 supercharged beat-a-go-go tracks defy a common held belief that the Chinese couldn’t rock, groove, or swing back in the 1960’s. The vocals are sung in the dialects of Mandarin and Hokkien and they soar with catchy hooks atop groovy, clever beats. There’s plenty of electric guitar, organ, and crazy percussion rocking and twisting behind it all, at times reaching quite a mad and freaky state of affairs. The record’s finale “Happy Lunar New Year” sung by Linda Yong may be the weirdest New Year greeting ever recorded. Every single cut is a winner and it never lets up from start to finish. Although most of the lyrics focus on love, innocence, and festive atmospherics, there’s an epic vibe to the music that rivals other extremely well-recorded and unique pop styles emanating from the surrounding Southeast Asian scenes during the late 1960’s. Seminal bands of the period like The Stylers and The Silvertones are well represented here backing up a wide array of popular vocalists with Charlie Electric Guitar Band’s Sound of Japan ripping it up on four brilliant instrumental tracks. CD comes with a 16 page booklet featuring gorgeous full-color photos of the original 45 sleeves and extended liner notes from compiler William Gibson.